In my professional life as a journalist, I only wrote one rumor story for which sourcing was truly sketchy. Generally my rule is this: Write what you know to be true in the moment based on the most reliable -- and identified, meaning we directly communicated -- sources available. But I didn't feel confident about my Oct. 17, 2001 iPod story. My source (only one) confirmed that six days later Apple would unveil a "digital music device", but it wasn't clear what that meant, something the story reflects. I reminisce about iPod because it's gone. CNET, where I worked when writing about the mystery music device, reported the device's disappearance yesterday. The link for iPod Classic now goes to iPod touch, and the music player is no longer sold at Apple Store Online -- not even refurbished. The extended name, adopted in 2007, is appropriate. The original iPod is a "classic". It is one of four foundational products released in 2001 that still drive everything Apple in 2014. Music changed the fruit-logo company long before iPhone established the world's largest tech company. iPod is part of the story. 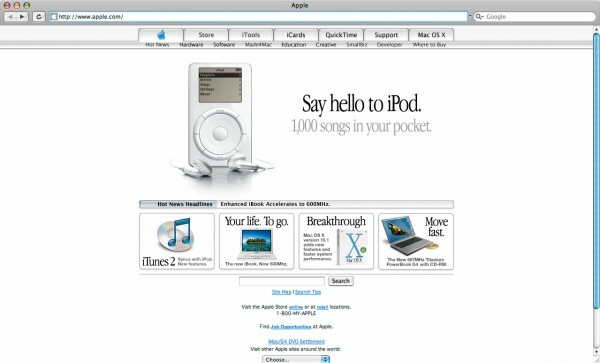 iPod represents something special about cofounder Steve Jobs and his leadership team, which included Tim Cook, Jony Ive, and Phil Schiller, at the Millennial's start. Jobs turned a misjudgment into something special. Apple was a latecomer to music. Big time. Rather than music, Apple has pushed hard into digital imaging, touting mid- and high-tier iMacs with DVD drives and FireWire ports for attaching digital camcorders. But in reality, consumers are more interested in CD-RW than DVD, analysts say. In June, for example, while more than 40 percent of systems sold included CD-RW drives, said Baker, only about 20 percent had DVD-ROM drives. And most of those computers also came with a CD-RW drive. I always find it funny when anti-Apple people invent reasons to knock them. This one has got to be the funniest yet. Now Apple is taking criticism for not encouraging the act of illegally pirating music. What a laugh! There inclusion of a DVD-ROM drive, iMovie software, and FireWire connectivity is a definite cutting edge strategy. Anyone who doesn't recognize this is clearly impaired. I seriously doubt if Apple missed the boat or anything on the CD-RW craze. Soon CDs will go the way of the 'floptical' drive and nobody will have anything but DVD-RAM drives (more data—less space) and they may even get into the new field of desk top video like I have. After all, what would you rather have in YOUR computer. An old CD-RW that takes forever to use or a state of the art DVD-RAM???? But then, maybe you just needed a topic to justify your paycheck, and this was the best idea you could come up with. I'm sorry to hear that and better luck coming up with a newsworthy idea next time. Maybe you could do a lengthy piece on how Apple has missed the boat by not staying with the beige color like everyone else. After all, according to PC data, more beige computers get sold every year than do colored ones. P.S. If you want a CD-RW in your machines so badly, I'll sell you mine (cheap)—so I can UPGRADE to a DVD-RAM and stay ahead of all those stupid people out there who still fight with a WinTel box every day. After all, I own a Macintosh and love to be 'AHEAD OF THE CURVE'. By December 2000, just four months later, Apple already looked beyond DVD-RAM to DVD-RW, which compatibility better fit home and professional movie discs. The company shipped the first CD-RW compatible, DVD-R SuperDrive on Feb. 19, 2001. Just want to say you may have missed the tune. iMacs have no cooling fans, which make them very quiet. CD burners run warm when used and most require a cooling fan. When you don't have a fan in the machine you have to use a external device and I don't think Apple is ready to go into the CD-RW business when they have well established manufactures with proven quality products that are compatible with the iMac. I think Apple has a sweet tune and computer buyers are beginning to get it. Try it. Apple released iMacs with CD-RW drives and iTunes on Feb. 2, 2001, just six months after the Mac dealer gave the heat excuse. Back on topic. Soon after I posted the "misses the tune" story, Apple bought SoundJam -- the foundation for iTunes, which launched in January 2001. Jobs admitted Apple missed out and fabulously changed direction, for which I take no credit. I only express that because some Apple Cultist will accuse me of claiming credit. Apple's musical turnabout is bigger than iTunes and CD burners. Macworld's "The Birth of the iPod" is a definitive history that explains how Apple developed the device in just a matter of months -- a fantastically short time, particularly considering the success. Yesterday, during the Apple Watch media event, CEO Tim Cook emphasized the importance of breakthrough user interfaces for new product categories. He identified them for three products, and all share one thing in common: Touch. That's mouse for the Mac; click/scroll wheel for iPod; and capacitive, multitouch screen for iPhone. But Cook over-simplifies, regarding iPod. Simple sync is the killer UX (user-experience) feature. Apple's DVD movie strategy meant people either made or bought their own movies. CD burners and iTunes capitalized on what music consumers already had, whether downloaded illegally or purchased discs. iPod gave users a way to carry the content they already owned with them. The ease of ripping to and organizing in iTunes was step 1. The second step mattered more. To sync music, users plugged their iPod into the computer. Competing devices used cumbersome, user-unfriendly, multi-step Wizards that didn't work as well. Something I will discuss further in a future post: The original iPod was well-balanced. There was excellent balance of features (click/scroll wheel, 5GB hard drive, battery life, and sync) to benefits (simple navigation, 1,000 song storage, lots of listening time, and drop-dead easy transfer to device). Then there was good physical balance -- how the device felt and could be used in the hand. I met with Apple's PR team in a Washington, D.C. hotel for an official briefing soon after iPod's launch. I received a review unit and bag of (20) CDs -- as Apple discouraged music theft but wanted journalists to get the full user experience. The meeting took place in the shadow of terrorist attacks that occurred 13 years ago tomorrow. One of the planes struck The Pentagon, which wasn't that far away. There was a grim mood in the area and around the country, which created poor receptive marketing atmosphere for launching anything. But Apple assumed another risk -- entering a new product category for which it had no prior experience and during financial hardship. Recession gripped the United States, and Apple had suffered share price and quarterly revenue setbacks as a result. I used the original-style iPod, which gained the "Classic" moniker with the sixth-generation release, until Jobs unveiled the nano in September 2005. The first iPod nano, for which some griped easily scratched, is to this day my favorite music player. The device was finely-balanced, felt and looked good, and delivered superb UX. Every nano that followed took something away from the original. These days, like many other people, I listen to music on my smartphone. But I remember where it all began -- on an autumn day, not long before Halloween in 2001.